Directions: Read the summary, watch the video and answer the discussion questions. You may want to read this AP recap of the speech and see the extension activities below. Summary: President Donald Trump covered a number of topics during his 2019 State of the Union address on Tuesday — from his continued call for a southern border wall to the record number of women representatives in Congress. In the president’s 82-minute speech, Trump warned of “ridiculous partisan investigations” that could derail the nation’s economic progress, a nod to special counsel Robert Mueller’s investigation into Russian election meddling and possible ties to Trump’s campaign. 1) Essential question: How does the State of the Union address provide an opportunity for unity in the country? 2) What issues did Trump discuss? What issues did Trump not raise in his speech? What issues would you like to have heard Trump talk about? 3) Presidents often use the State of the Union addresses to strike a bipartisan tone; “unity” was the stated theme of Trump’s speech. Do you think Trump’s State of the Union address struck a tone of unity that brought Americans together? Explain your response. 5) At one point, Trump said, “If there is going to be peace and legislation, there cannot be war and investigation. It just doesn’t work that way.” Trump’s statement, a nod to special counsel Robert Mueller’s investigation into Russian election meddling and possible ties to Trump’s campaign, warned of “ridiculous partisan investigations” that could derail the nation’s economic progress. You can watch the clip about it here and read the AP article here. Why do you think Trump’s statement drew a wide variety of reactions from Congresspeople and from members of the public? 6) What do you know about Stacey Abrams? What tone did Stacey Abrams strike with her official Democratic response? Why does the opposing party typically give a response after the president speaks? Did you agree with some of the points Abrams made? Which ones? If you didn’t, explain why. 7) Trump discussed several issues considered to be highly partisan in which Republican lawmakers gave standing ovations. You may want to review some of them here: late-term abortions; economy; border wall; and North Korea. Ask students: Why are these subjects referred to as “wedge issues?” Ask your students if they agreed with Trump’s thoughts on these issues? 8) Media literacy: Why might it be a good idea to follow “fact-checking” sites like Politifact, a non-profit fact-checking news organization? Check out at least three other news outlets that include a variety of perspectives. You will notice a large variety of reactions–some saying Trump struck a bipartisan tone while others saying the speech was divisive. Why is it important to read a variety of news sources before drawing your own conclusion as to the effectiveness of the speech? Take a look at the photo below. 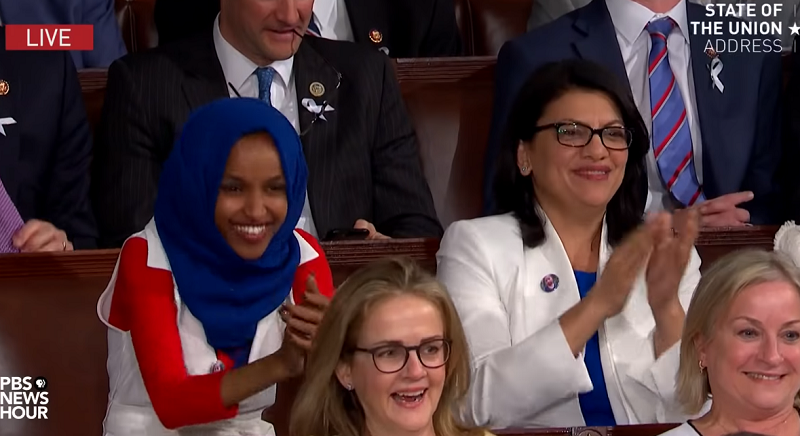 Why are the Democratic Congresswomen cheering in the photo? Why did they all wear the same color? What does the green pin that says E.R.A. stand for? President Donald Trump delivers his State of the Union speech on Feb. 5, 2019, a week later than originally scheduled. House Speaker Nancy Pelosi postponed the address during the 35-day partial government shutdown over Trump’s demand for border wall funding.